Crypto exchange Coinbase has launched a Visa debit card which will allow UK-based customers to easily spend their crypto funds. Coinbase expanded its services to the United Kingdom back in 2015. In an online post, Coinbase UK CEO Zeeshan Feroz said that “Coinbase Card” is powered by customers’ Coinbase account crypto balances, and can be used to make in-store as well as online payments. Coinbase Card supports all crypto assets available to buy and sell on the Coinbase platform. It is the first debit card to link directly with a major cryptocurrency exchange in the UK and EU, Coinbase said. The card is issued by Paysafe Financial Services Limited, which is authorised by the UK Financial Conduct Authority (FCA). “Customers can use their card in millions of locations around the world, making payments through contactless, Chip and PIN, as well as cash withdrawals from ATMs. When customers use their Coinbase Card, we instantly convert crypto to fiat currency, such as GBP, which is used to complete the purchase,” Feroz said. 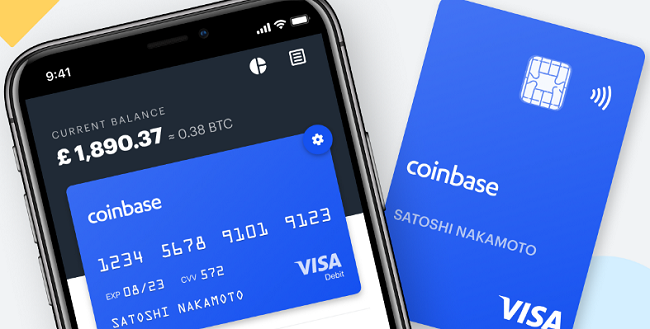 In addition to Coinbase Card, Coinbase has also launched the Coinbase Card app to enable customers to select which of their crypto wallets they will use to fund their Coinbase Card spending. The app is available on iOS and Android, and offers instant receipts, transaction summaries, and spending categories, among others. Coinbase customers need to just download the app and link their Coinbase account. Once linked, the crypto balance held on Coinbase will be immediately available to use through the virtual card, and their contactless Coinbase Card will be sent in the post. The debit card is currently only available in the UK. Coinbase said that it plans to roll out the service in other European countries in the coming months.